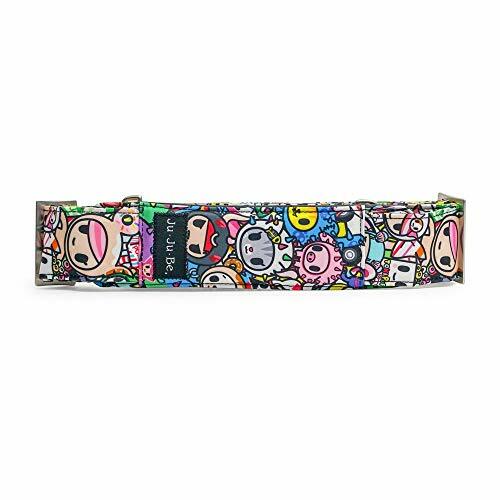 The Ju-Ju-Be Tokidoki Collection Messenger Strap has a memory foam shoulder pad with a grippe textile underneath; no more straps sliding off your shoulders. The adjustable messenger strap extends from 31-inches to 49-inches. Lose a strap? This will work great with your B.F.F., Be All, Better Be, or Be Prepared Ju-Ju-Be items. Want to add a strap to your Ju-Ju-Be Super Be to make it a messenger bag? Here it is. Add it to Starlet or Super Star to carry the bag over your shoulder. We are sure you will find many creative uses for this strap. Machine wash... air dry! All Ju-Ju-Be items come with a Lifetime Limited Warranty against manufacturing defects when purchased from an Authorized Ju-Ju-Be Dealer. Authorized Dealers can be found in the images. Founded in 2005, Ju-Ju-Be is a Southern California company that uses science, style, and attitude to create diaper items, purses and other fashionable accessories. Ju-Ju-Be assimilated the most advanced technology possible to create a stylish and intelligent product line that's unrivaled in the industry. Adjustable messenger strap with memory foam shoulder pad with a grippy textile underneath extends from 31 inches to 49 inches. Super convenient! If you have any questions about this product by Ju-Ju-Be, contact us by completing and submitting the form below. If you are looking for a specif part number, please include it with your message.